The region of the Hubble Deep Field where HDF850.1 is located. 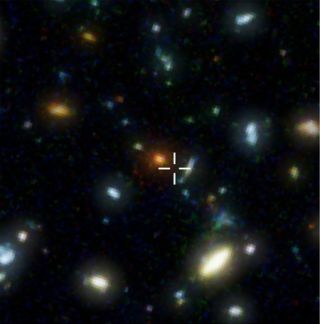 The cross indicates the submillimeter galaxy's position. For observations with ordinary, visible light telescopes such as the Hubble Space Telescope, the galaxy is completely invisible. After a decadelong hunt, scientists have finally pinned down the distance to an ancient galaxy teeming with star formation, finding it to be among the farthest galaxies of this type yet known, scientists say. The object is called a starburst galaxy because it is undergoing a burst of new star formation. It was first discovered more than 10 years ago, but astronomers have been unable to determine its distance until now. Today they announce that the galaxy is a whopping 12.6 billion light-years away, meaning that it existed just 1.1 billion years after the Big Bang. The galaxy, called HDF850.1, is located in a famous small patch of space called the Hubble Deep Field. This area was observed by the Hubble Space Telescope in 1995 and offered an unprecedented glimpse going extremely deep into space by collecting light over periods of 30 to 40 hours. "The galaxy's invisibility is no great mystery," study leader Fabian Walter of the Max Planck Institute for Astronomy in Germany said in a statement. "Stars form in dense clouds of gas and dust. These dense clouds are opaque to visible light, hiding the galaxy from sight." The light that we see on Earth as submillimeter, however, is not hampered by dust. The galaxy's extreme brightness in this particular wavelength band, however, tells astronomers that new stars are sparking into being at a tremendous rate — about 850 suns per year, which is 1,000 times higher than the rate of star formation in our own Milky Way. "It turned out that this one object had a star-formation rate of similar magnitude to all the other galaxies in the field combined," Walter told SPACE.com. "It was a complete mystery as to where this object is and at what distance it is." he Hubble Deep Field, with the position of the submillimeter galaxy HDF850.1 marked with contour lines. The lines represent the date of submillimeter observations of the galaxy; in visible light, it cannot be observed at all. Walter and his colleagues were finally able to determine the distance to galaxy HDF850.1 by looking for the signature of light released by molecular gas, which is a critical ingredient for star formation. The wavelength of this particular signature will be shifted along the electromagnetic spectrum by a process called Doppler shift, which increases the frequency of waves if they are coming toward an observer, and decreases their frequency if they are moving away. Because the universe is expanding, the farther away an object is, the faster it is receding from us. Thus, by determining how much light has been shifted from its rest frequency toward smaller, redder frequencies, astronomers can deduce how far away it is. This distance is denoted by the term "redshift." Previous efforts weren't able to scan as wide a range of frequencies as Walter and his team, so weren't able to determine the galaxy's distance. But the new analysis revealed a redshift of 5.2 — a great distance indeed. "There's only one other such source known that is at similar redshift," Walter said. "If you think about the cosmic time, there is really not much time, about 1/13th the age of the universe. It's really a very infant universe then and still, there is a galaxy forming stars at a rate that is much higher than any galaxy forms stars today." Ultimately, the researchers want to address the question of what causes such intense star formation in galaxies. Most astronomers suspect that mergers, when two galaxies collide, are behind these bursts. To confirm the hunch, Walter and his team plan to take further observations to search for signs that HDF850.1 has been in a galactic fender bender. The research is detailed in a paper published in the June 14 issue of the journal Nature.